Manchester, along with other northern cities have remained top of the list in House Price Index results from the first half of 2018, and have performed far better than their southern counterparts, confirming that the North remains the best place to invest. HPI reports have been published monthly since 2016 as a way of keeping track of house price levels in the UK, down to a regional and local level. From looking at the reports from numerous sources from January 2018 up to now, a few interesting trends can be seen. Whilst house prices in London remained the highest in the country during the first half of 2018, securing averages of between £468,845 (Nationwide) and £491,200 (Hometrack), the yearly increase on London property has stagnated somewhat, with the highest increase being just 1% this year (April 2017 to April 2018; gov.uk). Compare these results with those in Manchester, the North’s current leader in property, and a whole different story unfolds. Average house prices in Manchester have risen according to the government’s data, from £161,808 in June 2017 to £168,759 in the most recent report, and remained steady throughout 2018. This is expected to rise further in future reports, with the busy property season underway. Whilst on the rise, Manchester prices are still much more affordable than elsewhere in the UK, especially southern regions. This is because the average annual changes have remained strong since the turn of the year - between 4.9% and 7.7%. This has proven that Manchester prices are still rising at a higher rate year-on-year than the UK average (high of 4.7%) and far above those in London. 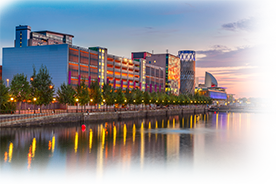 Taken alongside recent reports that Manchester is the best place for landlords, with average yields of 5.5%, it makes great reading for potential investors. With several large-scale developments due for completion in the next couple of years in Manchester, the average price of property in the city is only going to rise. There has therefore never been a better time to invest here. Nationwide’s HPI reports also show the whole North-West region is performing incredibly well, with above average monthly and annual % changes in average house prices, (3.2% annual change this quarter) higher than the current UK average (2.5%). Despite this, property in the region has remained affordable, with estimates putting the average price at around 2007 levels but rising steadily. This is opposed to unaffordable and stagnating London prices. “The HPI reports have made for interesting reading for the past couple of years. Taken on a month by month basis, many would find it hard to see trends – but when you look at the bigger quarterly, bi-annual or yearly picture, you start to see developing trends and get an idea of where the market is headed.